There’s more to teeth than meets the eye. 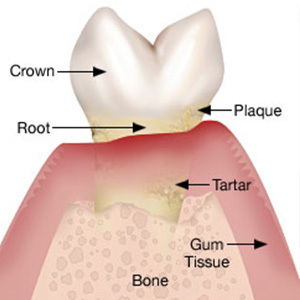 Hidden beneath the visible crown are the tooth’s roots set within the jawbone, secured and protected by the gums from bacteria and infection. But if the gums shrink back (recede), the roots become exposed and susceptible to disease, especially at the points where multiple roots branch from each other, areas called furcations. It all begins with periodontal (gum) disease caused by built-up bacterial plaque from insufficient brushing and flossing. The infection triggers inflammation that over time weakens gum tissues. They begin to detach from the teeth, which can eventually lead to gum recession and root exposure. This also causes bone loss, especially at the furcations. We can detect any loss (known as a furcation invasion) and how far along it may be with x-ray imaging or by manually probing with an instrument called a periodontal probe. There are three general classes measuring furcation invasions. In the earliest, Class I, we can feel the invasion as a slight groove; in Class II, it increases to two or more millimeters across. In Class III the bone loss extends from one side of the root all the way to the other (a “through and through”). At this stage a patient is in danger of losing the tooth, so we’ll have to act promptly. This means first removing accumulated dental plaque and calculus (tartar) to stop the infection and allow the gums to heal. With severe damage, we may need to assist healing with bone and gum tissue grafting, in which we place donor grafts to serve as scaffolding for the appropriate tissue to grow upon. You can help prevent this situation by practicing effective daily hygiene and visiting your dentist for thorough cleanings at least twice a year (or more if recommended). And at the first signs of a gum infection—swollen, reddened or bleeding gums—make an appointment as soon as possible to have it checked. The sooner we can detect and treat gum disease, the less likely a furcation invasion or worse will be in your future. If you would like more information on gum disease diagnosis and treatment, please contact us or schedule an appointment for a consultation.